Master Sgt. Stuart N. Sword, U.S. Army Garrison Bavaria S-3 Operations NCOIC. GRAFENWOEHR, Germany – Master Sgt. 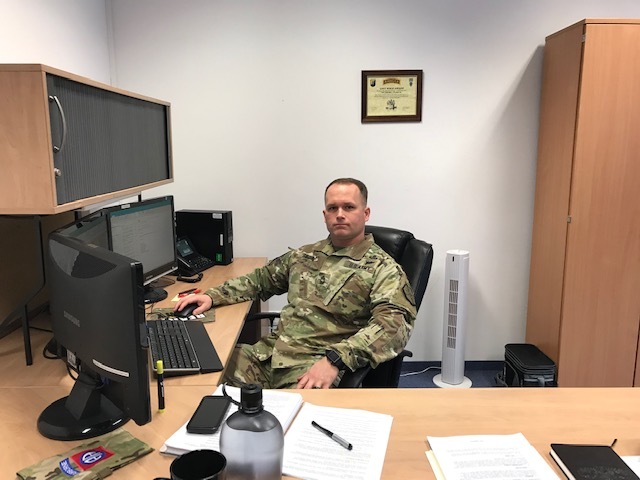 Stuart N. Sword, USAG Bavaria S-3 Operations NCOIC, played a key role in the planning and successful execution of the Grafenwoehr Health Clinic 2018 Influenza Pandemic Exercise. With a short suspense Sword drafted the Garrison operation order (OPORD) and personally followed up with tenant units and various Garrison agencies to ensure maximum participation was provided. Sword assisted in the coordination with ATHoc emergency messaging of the flu pandemic, providing awareness to over 8,000 Soldier, family members, and Department of the Army civilians in the Grafenwoehr community. Because of Swords efforts and support, the Grafenwoehr community surpassed the vaccination goal by six percent, vaccinating 96-percent of the active duty population, plus 366 DA civilians, retires, family members and reserve forces. Over 3,600 vaccinations were administered during the 60-hour Influenza Pandemic Exercise. The Grafenwoehr community leads the way in the 2018 flu campaign in U.S. Army Europe.